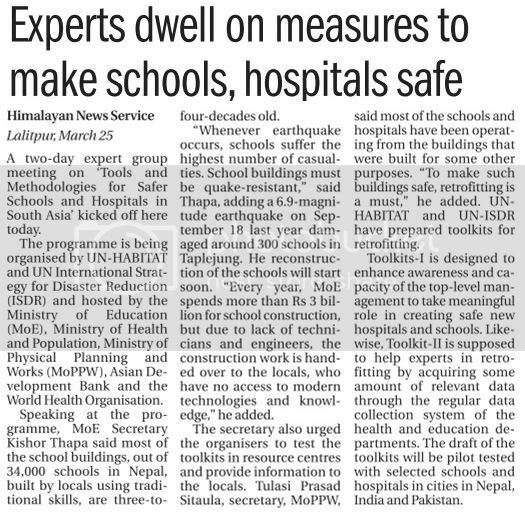 Experts from Pakistan and India joined local experts in Kathmandu, to review Tools for building new and retrofitting existing hospitals and schools. The two day Expert Group Meeting was organized by the UN-Habitat and UN-ISDR, and hosted by the Ministry of Education (MoA), Ministry of Health and Population (MoHP), Ministry of Physical Planning and Works (MoPPW), as well as Asian Development Bank, and the World Health Organization, as the co-leads of hospitals and schools safety respectively under the Flagship 1 of the Nepal Risk Reduction Consortium (NRRC). Following opening remarks of UN-Habitat Bangkok Chief Ms. Mariko Sato, overview of the Tool Kit was presented by Dr. P.K. Das, followed by remarks from SAARC Disaster Management Centre (SDMC) representative Mr. Mriganka Ghatak, WHO representative Dr. Lin Aung, MoHP Joint Secretary Dr. Sainendra Upreti, MoPPW Secretary Mr. Tulasi Prasad Sitaula, and MoE Secretary Mr. Kishore Thapa. In his opening remarks, Mr Thapa said that most of the school buildings, out of 34,000 schools in Nepal are 3 to 4 decades old. “We can’t afford to keep our children in unsafe buildings. We need to act now”, he added. Key issues discussed at the meeting were how to improve awareness and capacity of the top level management to make informed decisions for safe schools and hospitals and on the possibilities for retrofitting through ‘retro-maintenance’, where risks are measured as part of the regular maintenance and assets management through relevant data of the health and education institutions. 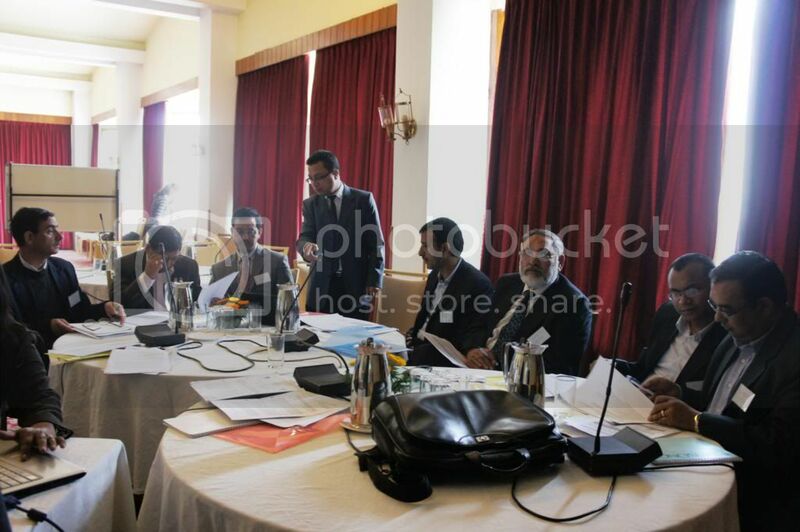 Specific suggestions from the three countries experts helped improve the draft toolkits in the area of checklists, guidance notes, issue importance, hazard importance, scoring scale and the overall concept and methodology. The preparation of the Tools are been carried out jointly by UN-Habitat and UN-ISDR with the support of the SCMC and are being field tested by relevant ministries, and other partners.